The most infamous doctor of the gothic era once again delves into the forbidden secrets of the world, when literature's most famous creature lives again ...Frankenstein—his very name conjures up images of plundered graves, secret laboratories, electrical experiments, and reviving the dead.Within these pages, the maddest doctor of them all and his demented disciples once again delve into the secrets of life, as science fiction meets horror when the world's most famous creature lives again.Collected together for the first time, here are twenty-five electrifying tales of cursed creation that are guaranteed to spark your interest—with classics from the pulp magazines by Robert Bloch and Manly Wade Wellman; modern masterpieces from Ramsey Campbell, Dennis Etchison, Karl Edward Wagner, David J. Schow, and R. Chetwynd-Hayes; and new contributions from Graham Masterton, Basil Copper, John Brunner, Guy N. Smith, Kim Newman, Paul McAuley, Roberta Lannes, Michael Marshall Smith, Daniel Fox, Adrian Cole, Nancy Kilpatrick, Brian Mooney, Lisa Morton, Stephen Volk, and Jo Fletcher. Plus, you're sure to get a charge from three complete novels: The Hound of Frankenstein by Peter Tremayne, The Dead End by David Case, and Mary W. Shelley's original masterpiece Frankenstein; or, The Modern Prometheus.As an electrical storm rages overhead, the generators are charged up, and beneath the sheet a cold form awaits its miraculous rebirth. Now it's time to throw that switch and discover all that man was never meant to know. 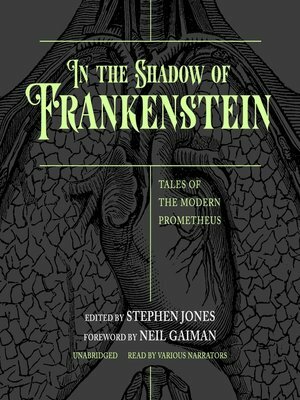 Stephen Jones is one of Britain's most acclaimed horror anthologists and winner of several World Fantasy Awards, numerous Horror Writers Association Bram Stoker Awards, and several International Horror Guild Awards. He lives in London.